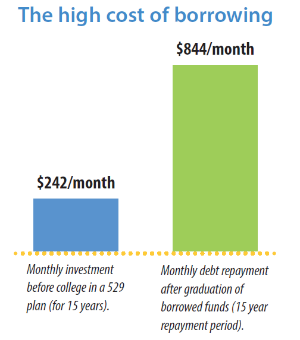 In the past, most families began saving for college when their children were in high school, and expenses were paid from both savings and current income. Today, though, the continuously rising costs of higher education have made this method of funding inadequate. We know that saving for a college education can be hard since the costs go beyond tuition — there are books, fees, room and board, and so much more to consider. With these costs consistently on the rise, saving enough can seem overwhelming. There are many advantages to saving for post-secondary education with a 529 - one of which alleviates the overwhelming cost of college when the time comes. No income restrictions. Anyone can establish an account for a student regardless of his or her income level. High contribution limits. Limits vary by plan. Versatility. Since there are no state residency requirements, money invested can be used at accredited public or private colleges, trade or graduate schools in the United States. Control. You can change the beneficiary to another family member, including yourself, without tax consequences. Investment choice. Take your risk tolerances into consideration and select the investment strategy right for you. Most 529 plans offer a wide variety of investment choices. Many allow you to build a custom investment plan tailored to your risk tolerance and investment horizon. Participation in a 529 College Savings Plan (529 Plan) does not guarantee that contributions and investment return on contributions, if any, will be adequate to cover future tuition and other higher education expenses or that a beneficiary will be admitted to or permitted to continue to attend an institution of higher education. Contributors to the program assume all investment risk, including potential loss of principal and liability for penalties such as those levied for non-educational withdrawals. Depending upon the laws of the home state of the customer or designated beneficiary, favorable state tax treatment or other benefits offered by such home state for investing in 529 college savings plans may be available only if the customer invests in the home state’s 529 college savings plan. Consult with your financial, tax or other adviser to learn more about how state-based benefits (including any limitations) would apply to your specific circumstances. You may also wish to contact your home state or any other 529 college savings plan to learn more about the features, benefits and limitations of that state’s 529 college savings plan. For more complete information, including a description of fees, expenses and risks, see the offering statement or program description. If you begin depositing $242 per month when your child is three years old and continue these monthly investments for 15 years, you’ll have saved more than $100,000 when the first class bell rings: $43,560 in principal investment and the remainder in earnings on that principal, based on a 10 percent rate of return. If, instead, you choose to borrow $100,000 at 6 percent interest to pay for your child’s four years at college, you — or your child — will face payments of $844 per month for 15 years after graduation. The total cost to you of the “borrowed” degree is $151,920. The difference between the total cost to you of the two degrees? $108,360 — enough to possibly fund a second college education. Hypothetical investment assumes 10 percent average annual total return, compounded monthly. The hypothetical borrowing scenario assumes a $100,000 loan is paid over 15 years at 6 percent interest, compounded monthly, beginning after college graduation. The 10 percent rate of return is based on the historical performance of the S&P 500 Index, an unmanaged index representative of the U.S. stock market, and assumes an investment is made for more than five years. An investment cannot be made directly in an index. If you would like to learn more about how you can save for a college education, please call us at (281) 277-6400 to schedule an appointment.